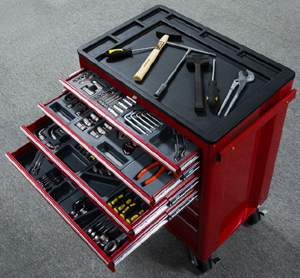 Home/Tools/How Do You Keep Your Tools Organized In Your Garage? In most of the houses, the garage is considered more as a storage space than a room and that explains why it is always found disorderly. However, in order to ensure lasting results, the garage should be treated as any other room in the house and follow the same basic procedures as one would adopt in organizing a room in the house. It is not possible to sort out the articles scattered all over the garage in one weekend; it involves a lot of time to clear the mess and arrange various tools systematically in the garage. The first stage in organizing the garage is to decide in what way the garage would be used; whether as a workshop, storage space, to a certain extent as an additional room for youngsters or for parking the car as well as a tool room. The next stage is to separate the garage into three different parts such as floor space, the garage wall with a window and the other three walls, with each one of them serving different purposes and organized accordingly. After that, the garage should be thoroughly cleaned, arranging first those tools that should be kept on the garage floor. There can be three heaps one for garbage, the second one for garage items meant for sale and another one for storage. To start with, make into one lot all the garbage items. If it is not apparent whether some items are trash or not, those can be put in the pile meant for storage items for sorting out later. If certain items have not been used or even seen for over a year or so, they can go to garage sale items pile. Various tools and other articles in the boxes can be left as they are till the wall space with storage racks and bins are properly set up. The process of organizing the garage should commence with disposal of garbage. This leaves two heaps to sort out. A similar method can be adopted for the walls as well. All the articles including the one in the boxes such as hand tools, garden tools and any old shelving material should be distributed between the two remaining heaps and a third pile for collecting items that are to be thrown away should be added. In order to generate some cash, it is better to organize first sale of garage items. What could not be sold in a garage sale can be disposed of or given away to someone. The money raised in the sale of garage items will be useful for buying garage storage units and shelving. After completion of the sale of garage items and addition of some more items that are not required to garbage dump, the work of cleaning up the garage can be taken up. All the items in the garage should then be taken out, leaving only blank walls and a vacant floor. The cement floor should be washed thoroughly and if there are ‘gyproc’ walls, they should be cleaned using a vacuum cleaner. The next step is to sort out all the tools and other items in the garage and stack them based on a specific plan. For example, hand tools should be placed in one lot, garden tools in another, and boxes should be kept in different locations in the garage. Bicycles and other heavy articles that cannot be placed on shelves should be placed in one side. This is necessary if the car is going to be parked in the garage. One portion of the garage should be earmarked for the automotive parts and tools, oil and antifreeze. If a portion of the garage should serve as an additional room for youngsters, then the floor should be painted with cement paint so that one can use an outdoor rug to make the place comfortable. Regarding lighting, fluorescent lighting is ideal for the garage.